Women live by cycles, so if you are like most, daylight savings time came and went, and with it went your natural circadian rhythm. Sleep deprivation is probably the most prevalent reason for under-eye circles. 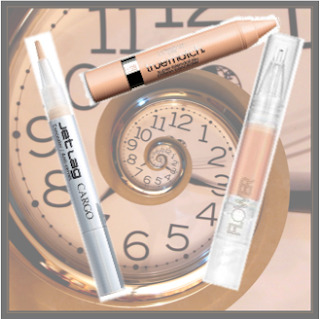 Counteract the fact that your sleep pattern in a tailspin with an innovative, full-coverage concealers. Check out these three potent formulas that erase signs stress and fatigue without creasing or clumping. This innovative, easy-to-use stick concealer offers a versatile, on-the-go solution for covering blemishes and imperfections. The point of the crayon allows for precise application, while the side of the crayon can easily canvas a larger area of skin such as under eye. The formula contains high levels of liquid and soft (vs. hard) waxes giving it an ultra-creamy, lightweight texture with superior blendability. Its high-pigment concentration provides excellent coverage, while the elevated liquid content, silicone elastomers and light-diffusing pigments keep the product from looking cakey on skin. Combining cutting-edge skin care with a full coverage concealer, Jet Lag™ works on the spot to brighten the eye area. Jet Lag™ is a dark circle-erasing concealer that provides optimum coverage with light-diffusing pigments to brighten the eye area with fortifying, nourishing and repairing ingredients to reduce dark circles and puffiness over time. Free of parabens, fragrance, and synthetic dyes. From FLOWER – the NEW full cosmetics range co-founded by Drew Barrymore and available exclusively at Walmart – This concealer creates an invisible veil on skin that perfectly smoothes and hides any imperfections. It mirrors the natural luminosity of the complexion by using an aerated, thin film that blends for seamless high coverage. Shades: BC1, BC2, BC3, BC4.